The formidable lead guitarist with The London Souls, Tash Neal, was born into a musical household. His mother was a pianist and his father a multi-instrumentalist jazz musician. Fortunately for young Tash, both parents had a high regard for music education and so, at the tender age of eight, when his father asked him which instrument he wanted to learn, Tash nominated the guitar. "I picked guitar almost randomly - it didn't really jump out at me, but fortunately I showed an affinity for it." Who has he listened to? Initially, Tash's learning focused on classical guitar and he soon showed some skill on the instrument. He was drawn to the power and intensity of rock music, deciding to dedicate himself wholly to becoming a professional player. "I heard David Gilmour from Pink Floyd - the guitar solo on Time changed my life - then I heard Hendrix, Clapton's Crossroads solo, Prince - all that kind of mind-blowing stuff happened to me at the same time." What's so great about his playing? You'd have to go a long way to find a guitarist who puts more passion into his playing. Tash's apprenticeship began while he was still at high school in New York, his prodigious ability on the guitar enabling him to play in the many bars and clubs in the city, despite being too young to legally be there. When he met bandmate Chris St Hilaire, their shared infl uences acted as a considerable catalyst in his music career. "We realised what we wanted to do musically: everyone else was more concerned with what was going on around them, they didn't have a voice or something to say, some kind of unique songwriting sensibility, but we recognised it in each other straight away." Why do you need to hear him? Imagine a mix of bands such as Led Zeppelin, Humble Pie, The Kinks and the Small Faces, add a contemporary edge and bags of attitude and you're just about there. When they met, both Tash and Chris had a very wide range of infl uences and a refreshing view on how music works. "We thought James Brown was rock 'n' roll, we thought Miles Davis was rock 'n' roll - anybody that was badass! That freedom brought us together." For a long time, Tash was using a Vox AC30, but a recent tour of Europe that saw The London Souls playing larger venues meant that he needed some additional firepower in the backline. So he's added a Fender Bassman into the mix, using an A/B switcher to bring out the different tonal colours inherent in the different amps. Sometimes, he'll use a Bassman 100-watt head with a cabinet on its own, depending on the size of venue and whatever happens to be available to him on the road. 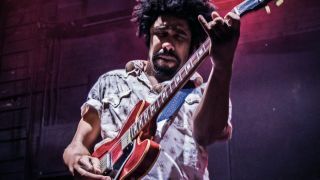 As far as guitars are concerned, Tash is practically inseparable from his Gibson ES-335, but recently, he's been spotted playing a hybrid Tele. "We were playing a show with Jim Oblon, who actually drums with Paul Simon and who is one of the greatest guitar players I've seen in his own right. I broke a string and he let me play his Telecaster and he said, 'That thing looks good on you…' He ended up giving it to Chris to put in the van, because he knew I wouldn't take it. So I ended up with that guitar - he just gave it to me." The new album, Here Come The Girls, is a virtual manifesto of everything The London Souls are about, with some powerful songs and great performances throughout. "Making records is where it's at for us. We want to make the best records we can - and we're getting better and better at that." Here Come The Girls is out now on Feel Music. Head to The London Souls official website.